Sarah was great and a great grandmother to my daughter, Michelle. Shelly shared Sarah’s height, her weight, her strength hidden in soft words: oh my, is that so, well I never. And now Michelle is to marry. May I do a soft quilt for a strong woman? After all she must accommodate the other, resolve the opposites. I will create a sweet quilt of buttons and bows, lace and ribbons, pinks and blues. 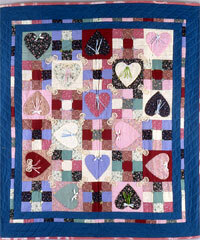 I will create a strong quilt of nine patched blocks and appliquéd hearts. A country quilt of bright lights and dark borders. My daughter will marry and Sarah will laugh and cry with her.